Master sculptor Santiago Medina's Tuscany inspired Italian stainless steel masterpiece sculptures are at marquee public art venues such as Harvard, Stanford, Tufts and Washington University among many others. He is the only Colombian-American sculptor to have a permanent monumental sculpture at Harvard University. His avant-guard sculptures have been displayed at major worldwide art fairs such as at Art Basel Week Miami, Wynwood Art Fair, Houston Art Fair, Palm Beach International Art Fair and Arte America. 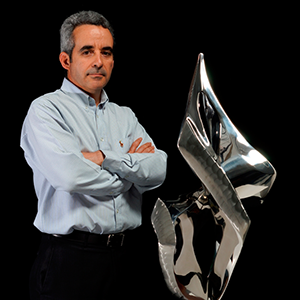 Medina summarizes his artistic passion as "I bring inert stainless steel to life by creating timeless masterpieces full of light and movement for art lovers". Also an accomplished physician with brain imaging expertise, Medina distinctively uses advanced medical imaging technology such as Computerized Tomography (CT) and Magnetic Resonance Imaging (MRI) to scan his sculptures and subsequently enhance their volumetric appeal and sculptoric form. Therefore, Medina brings powerful artistic expression, technological sophistication and physician sensitivity to his beautiful artwork. This uniqueness allows him to create vibrant masterpiece that will transcend generations.